Side Cash Resources Is It a Wal-Mart Mystery Shopping Job- or is It a Mystery Shopping Scam? Is It a Wal-Mart Mystery Shopping Job- or is It a Mystery Shopping Scam? Mystery shopping is a legitimate way to make extra money and score free goods and services while evaluating shops such as grocery stores, restaurants, car service stations, etc. I myself have been evaluating oil change locations for several years now- and getting paid to have my car oil changed. I also occasionally evaluate a local fast food chain- as a result, I have yet to pay money for a single sandwich I’ve purchased there. Mystery shopping does work and is not a scam. In fact, we’ve even reviewed mystery shopping and the companies that conduct it. Completed ‘shops’ pay anywhere from a few bucks to several hundred dollars depending on the amount of time, travel and effort required. Incidentally, HomeGrownMommy wrote a great review about mystery shopping as a side hustle for extra money and free stuff. While you won’t get rich with or even replace your part-time job with mystery shopping, you will make some extra money and get free products and services to boot. However, when a mystery shopping assignment offers to pay you hundreds of dollars for doing just 20 minutes of work, beware. For example, here’s an email I received back in July, where the “company” offered me a whopping $235 for doing only 20 minutes of work. 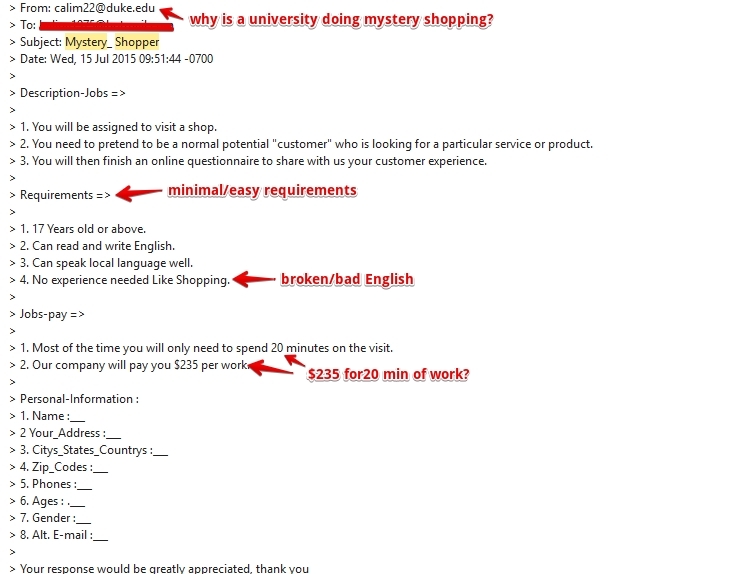 Notice the many red flags inherent in this scam mystery shopping email, including the email address of the scammer, which went to a university and not a place of business. In this recent email, I was told that someone had recommended me as a mystery shopper to National Shopping Service Network, LLC, a company based in Denver, Colorado. However, the email itself was from Greece. My mystery shopping pièce de résistance tells the story about a mystery shopping scammer who took it upon him or herself to text me about my shop. Over the course of two months, my scammer and I went back and forth about the shop ‘assignment’ that I was to complete at Wal-Mart. This shop, incidentally, required that I evaluate the level of service at Wal-Mart, including the ‘smartness’ of my cashier, as I attempted to both cash a check and then purchase a Moneygram with the leftover check money. PLS Note that your assignment location is any WAL-MART outlet close to you, You are to Survey Walmart and use their Money Gram service. Hand out $2450.00 to the Money Gram agent, tell them you would like to send money in minutes to a receiver, Receivers info is below. INFORMATION OF RECIPIENT YOU WILL TRANSFER MONEY GRAM Receiver’s Name- CONNIE WELCH City :- ROTHBURY States:- MICHIGAN Zip code:- 49452 Country :- UNITED STATES You should email the scan copy of the Wal-Mart/MoneyGram Receipts and also the MoneyGram Reference number (8 digit #) of the transaction along with your evaluation feedback reports after completion of this assignment today. NOTE: You must not disclose for any reason that you are a mystery shopper, or let them know you are evaluating their store. While using their service, You should make the below listed observations from both stores which you survey – • Store Name & Address • Name of the Cashier (If visible on tag) • Neatness & smartness of the Cashier • Customer Service Professionalism? • The Reference number (8 digit #)? • Sender’s full name (Your name as used in complete the transfer)? • Actual amount sent after Money Gram fees? • How long did it take you to complete transfer? Prior to receiving this shopping assignment, I had been mailed a rather hefty check for $2,465. Only $400 of that money was mine- the rest was supposed to be used to purchase a Moneygram and then send it over to a third party. Of course, the minute I cashed my check and purchased the Moneygram, someone would be out $2,065. During this time, my scammer kept pestering me about when I would deposit my check and send over the Moneygram number to him/her. My scammer insisted that I complete my assignment by ‘evaluating’ Wal-Mart; however, if all else failed, I could just try cashing my check at my own bank instead of Wal-Mart. So much for completing my mystery shopping assignment as instructed. On my end, I played up the idea that the IRS was after me and so I couldn’t keep a bank account. I also had money issues and couldn’t pay the check cashing fees that Wal-Mart demanded. At several instances, I actually tried to scam my scammer by asking for a few bucks from him/her to cover my check cashing fees. Scammer: How are u doing today ? I would love to know what is going on..I didnt had from you for days now…Kindly get back at me as soon as possible..
Scammer: kindly get your assignment done in time asap by Monday , we will be expecting your evaluation report as soon as you are done . Clearly at the end of his/her wits, my scammer eventually threatened to call the police on me if I failed to complete my assignment. Scammer: why are u not replying my text again ? Me: I’m at work now. Once I let my scammer know that I was in on this fake check scam, he/she stopped texting me. That is, at least until I decided to text him/her a few days after the blow-up. I figured I’d get no response because the blow-up was still fresh in his/her mind. Not only was my scammer happy to get back in touch with me, he/she was asking me again about whether or not I’d cashed my fake check. I guess some scammers never learn- or remember. How do you avoid mystery shopping scams? Loads of money for little work. Oftentimes, scammers try to catch your attention by offering you hundreds of dollars for minutes of work. This is not the case with legitimate mystery shopping assignments, which requires hours of work before you even see your first hundred dollar reimbursement. The assignment is texted or emailed only. Legitimate mystery shopping companies have websites and software platforms that you work on to submit your assignments. The assignment questions are usually laid out in a table, and there are defined parameters/times to each of these questions. Very little of your assignment is left to chance or personal interpretation. Also, you can preview your questions long before you complete your assignment. The emails are from private/international email accounts. Scammers often use their own private email accounts to email you assignments. Alternately, they might create an email account that contains the name of a legitimate mystery shopping company, but which originates from an overseas country. The assignment language uses broken/colloquial/unprofessional terms. 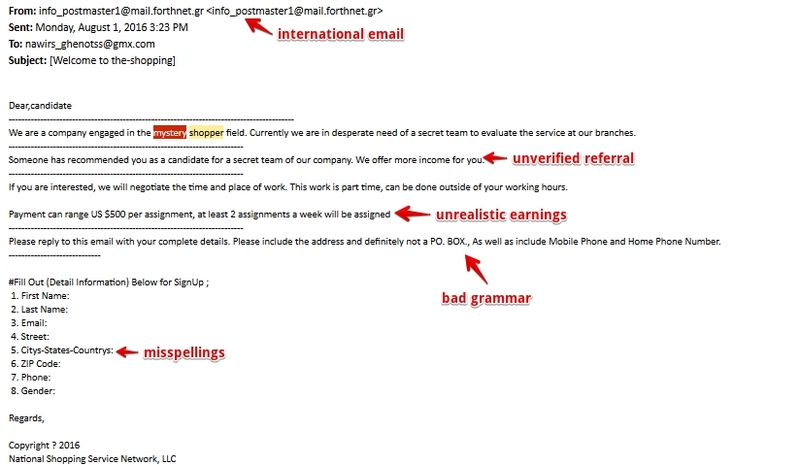 Business communications don’t typically have lots of typos, bad grammar and colloquial phrases like “kindly inform us.” Such terminology is usually a good indicator that your “employer” is actually a scammer whose first language isn’t English. You might also wish to cross-check your emails and texts with the Mystery Shop Forum, which lists over 200 legitimate mystery shopping companies and whose moderators can advise you about the legitimacy of your communications. Have you received an email or text with an invitation to complete a high-paying mystery shopping assignment, especially one where you need to cash checks? If yes, please post your email or text below in the comments.